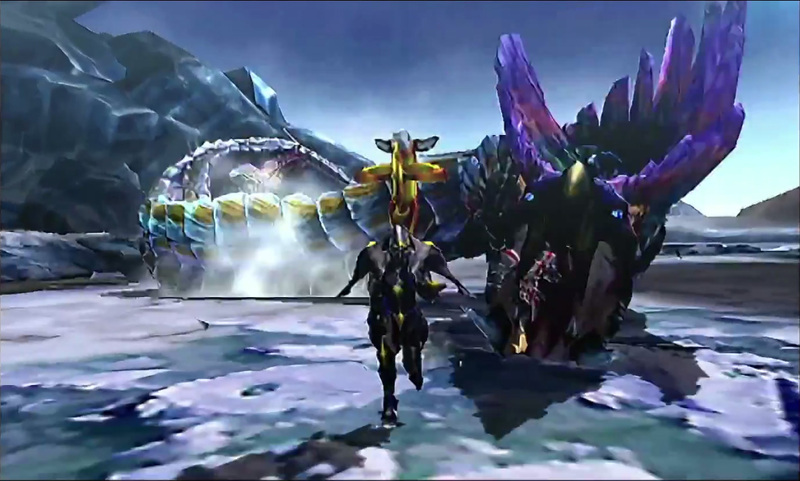 The Tidal Najarala is one of the new subspecies encountered at G rank. It has an innovative attack which I reckon is super cool (even if it is super annoying). 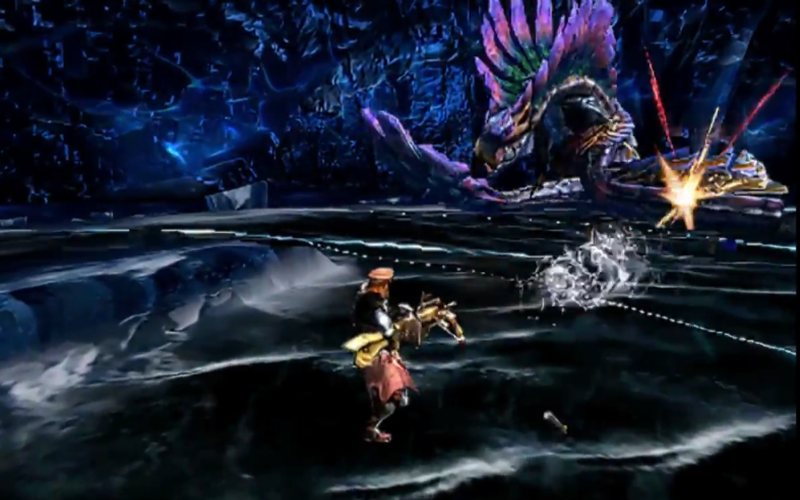 The Tidal Najarala is one of the new subspecies in Monster Hunter 4 Ultimate. It’s found in the tundra that is the Frozen Seaway, and is weak to fire and lightning. It’s mostly blue in colour, but also has greens, yellows and purples all along its body, making it one of the more colourful monsters. 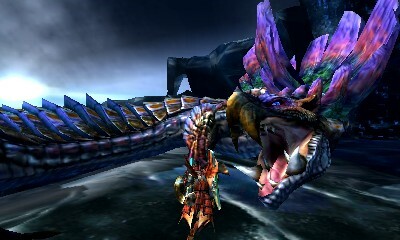 The Tidal Najarala is a snake wyvern, and puts its long body to good use. It likes to slither across the map to approach before a strike. It can also flick its tail out a fair way for a long-range attack; there’s a variant on this attack that will also pin you. When it does this, it’ll wrap its long body around its target and squeeze until you’re able to break free. It has another coil attack, which I bitched about in the article for the other Najarala. It’ll form a circle around you, leaving a small gap between its head and the end of its tail through which you can escape. But you have to be quick; you have a second or two before it slides in a circle and changes the place where you can run. If you fail to escape the second time, it will close in and crush you for massive damage. But wait, there’s more! It has a paralysing bite. So as you try to run past its head to escape, it will attempt to bite you to keep you stuck there. I have yet to successfully escape after it’s landed its paralysis bite, though I have escaped plenty of times without it having to come to that. Of course, if you use the insect glaive, you can just vault over the top of its body to escape. Too easy. It’s capable of lashing out with its jaws in a bite attack. It can do this twice in a row, after which it will have a brief rest and allow you to get some hits in. The head will be inflicted with a scar when you break it; its tail, tiny legs and the large scales on its head can all be broken too. The Tidal Najarala will burrow through ice and snow to get from one area to the next. It can also burrow and then come up up through the ground to attack the hunter. My favourite feature of this monster is its innovative use of its scales. It’s so annoying. But so cool! Like the previous Najarala, the Tidal version can throw some of its scales on to the ground. However, this one uses them differently. It will fire a projectile at them, which will then bounce off and change their trajectory to go after someone in the area. So you’ll dodge it, and then it’ll bounce off a scale and hit you anyway, inflicting you with waterblight. Super cool, but man, so annoying. That’s it for the Tidal Najarala. Next week I’ll take a look at the Seregios, which has also been known as Steve!